There is no place where a great war story about the Buffalo Bills is unwelcome. Take Sunday, for instance. Legendary running back Thurman Thomas was telling a group of 20 rapt listeners about being unceremoniously dropped by the Buffalo Bills after the 1999 season, and how he found out by watching the crawl on ESPN. He signed with the Miami Dolphins in 2000 out of spite and revenge. The week before the Dolphins were to face off against the Bills, Thomas got a call in the Miami locker room. Thomas didn't know who was calling, but he wasn't up for distractions. "Tell 'em I'll call them back," he said. When the phone rang a few minutes later, however, it was Bills owner Ralph C. Wilson Jr. on the line. You want to know what happened next, don't you? So did the group sitting attentively in the middle of the Albright-Knox Art Gallery. Standing in front of a five-foot sculpture with hundreds of aluminum pots and pans piled beneath a series of water taps, titled "This is Not a Fountain," Thomas kept going. He didn't know much about art, but he knew a lot about Ralph Wilson, in whose honor the gallery was showcasing the Impressionist exhibition "Humble and Human," in partnership with the Detroit Institute of Arts. And when Wilson called him in Miami, Thomas set aside his hard feelings long enough to pick up the phone. Wilson wasn't proud of how Thomas was released by the Bills and told him so. "I don't know how many times in his life he said, 'I'm sorry,' but that was one of them," Thomas said. After that game, Wilson sourly told him, "You looked better in red, white and blue." It wasn't lost on the Bills Hall of Famer that he, a man who owns no art like the kind that hangs in the Albright-Knox, was holding court in the gallery's Sculpture Court. Wilson's wife, Mary, introduced him to fine art a few years ago, he said. He appreciates Impressionist art enough to know that he's a fan of Claude Monet's work. And he knows that the frame of a sports photo conveys a wealth of information about the success or failure of a single play. But as the only member of the Bills whom Wilson referred to as his "stepson," Thomas had a lot to say about the owner and philanthropist who helped make the "Humble and Human" exhibition possible. He talked about how Wilson entered the Bills locker room after each of the team's four Super Bowl losses, pointed to each player and recounted a play during the season that made the team's appearance at the Super Bowl possible. And he talked about how he got a second call from Wilson after he tore his ACL knee ligament after nine games with the Dolphins in November 2000. He knew his career was over. And so did Wilson, who called Thomas again. This time, it was to personally ask Thomas to sign a one-day contract with the team so that Thomas could retire as a Bill. "I claim Mr. Wilson was the best Buffalo Bill ever," said Thomas, 53. His comments weren't all about Wilson. 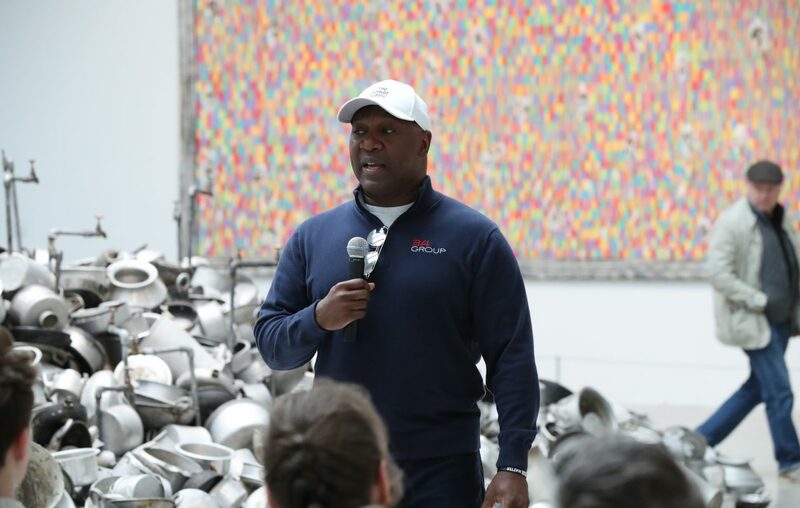 As other gallery patrons wandered through the Sculpture Court oblivious to the fact that the Bills Hall of Famer was standing in their midst, he gamely fielded questions and shared hilarious stories about his time as a player. He recounted a pre-season game against the Houston Oilers in 1988. Thomas wasn't expecting star quarterback Jim Kelly to call running plays — all involving him — in the first six plays of the game. Each time Thomas lined up, he saw Kelly dripping sweat in the hot, domed stadium. Thomas detected a strange odor he couldn't place. But when he sidled up closer to Kelly, his nose identified the smell — Johnny Walker. Kelly was hung over after having spent the previous night with his former teammates from the Houston Gamblers. "I had a rough night," Kelly told him. In response to a question about The Comeback, when the Bills overcame a 32-point deficit against the Oilers in 1993, Thomas said he remembered listening to wide receiver Andre Reed grousing to him on the sidelines about how nobody was throwing him the ball. By this time, both Thomas and Kelly were out of the lineup, and Thomas was astute enough to recognize that Reed was about to get his chance to break out. "It's getting ready to be your game," Thomas recalled telling him. "You just watch." Reed wound up being credited with eight receptions and three touchdowns. Lockport parent David Mullane patted his 15-year-old son sitting next to him and told Thomas about how the Bills never used to lose, and how his son, Andrew, has never known them to win. Then Andrew told Thomas how some of his high school friends have chosen to become fans of other teams. He asked why they should stay loyal. "It's your choice," said Thomas, with a calm but mildly disapproving expression. "What would your parents think about that?" David Mullane curled his fingers and stuck out his thumb and made a jerking "you're-out" gesture. But like everyone, Mullane wanted to know if Thomas thought the Bills had a shot at the big game this coming season. Thomas said the team is heading in that direction, under stable leadership and with a strong quarterback. But there's always "No. 12 in New England" to contend with, reluctant to mention Patriots quarterback Tom Brady by name. The Bills Mafia might hate the team and resent their ability to survive scandals like "spygate" and "deflategate." But Thomas isn't kidding himself. "To win six Super Bowls, I would have done spygate, too," he said. "Give credit where credit is due. They've been a consistent organization."